First, let me get rid of Kalebdjian’s lamb.BZ.1938.35. It’s a superb thing, and I strongly advise you to get it at Frs. 25,000. Really for nothing. Kaleb. says, and I don’t doubt it, that the owner paid 80,000 for it some 10 years ago. It’s really Burgundian Romanesque of the highest quality, and in flawless condition, with not a trace of restoration. Far finer than the photo led me to believe. And then—the thing Dodge wanted me to see, and of which he’s going to send you a photo. It’s a group, Byz., ivory,BZ.1939.8. of the B.V.“Blessed Virgin.” between St. John Bapt. and St. John Chrisostom. Once a panel, the background has been cut out—probably because it got broken; but the 3 figures have not suffered—only the Virgin’s mantle a little, lower R. The quality is of the very highest—closely allied to the St. John Baptist panelSaint John the Baptist, Byzantine, tenth-eleventh century, The National Museums and Galleries on Merseyside, Liverpool Museum, M8014. 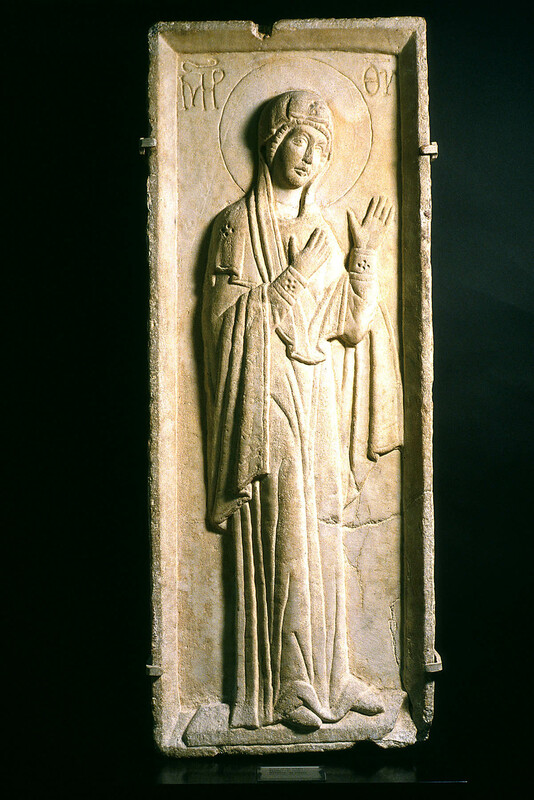 See Margaret Gibson, The Liverpool Ivories: Late Antique and Medieval Ivory and Bone Carving in Liverpool Museum and the Walker Art Gallery (Liverpool: National Museums and Galleries on Merseyside, 1994), 54–55, no. 20, pl. 20. 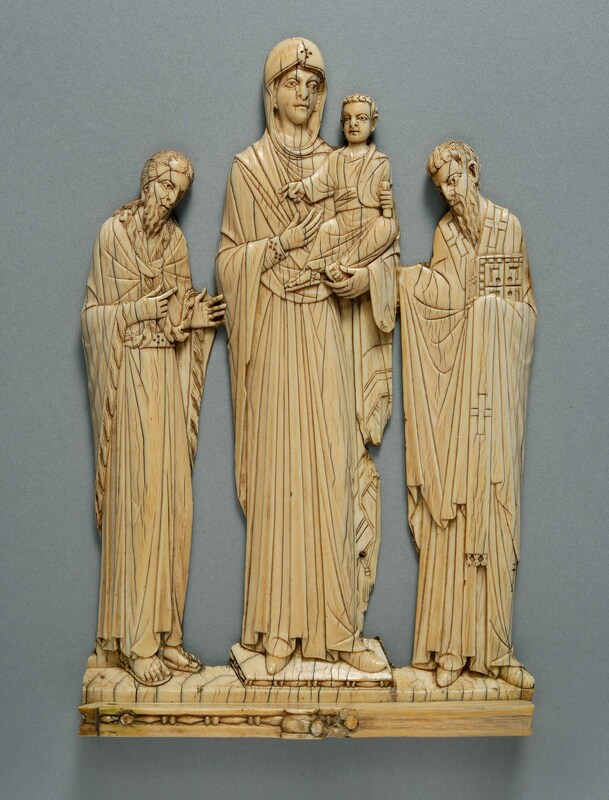 (also cut out, but rebacked) in the Liverpool Museum, and to the Harbaville TriptychHarbaville Triptych, Byzantine, mid-eleventh century, ivory, Musée du Louvre, Paris, inv. no. 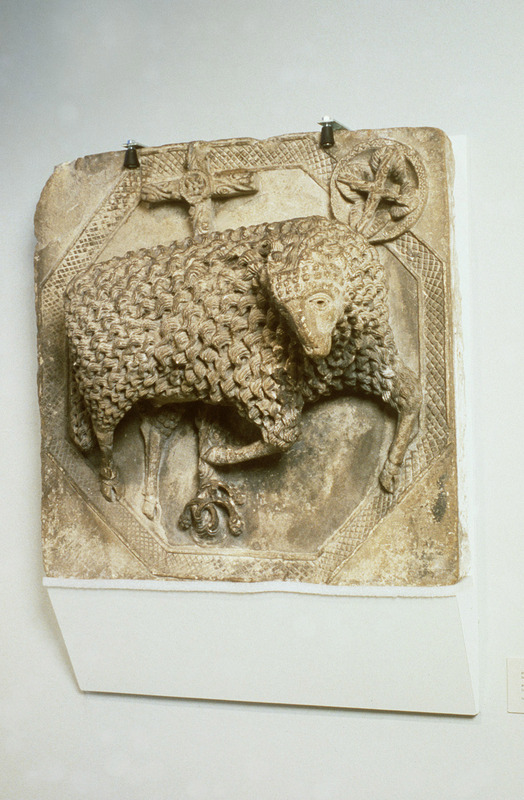 OA 3247. in the Louvre, and to the panel in Pal. Venezia in Rome.Triptych with the Deësis and Saints, Byzantine, mid-tenth century, ivory, Museo Nazionale del Palazzo di Venezia. Very beautiful drapery, of marvellous mastery, beautiful hands and feet. Lovely light “ivory” patina. Also closely allied to the two saint panels in Dresden (which we’re after) ViennaAndrew and Peter, ivory, Kunsthistorisches Museum, Vienna, no. 26736. See Adolph Goldschmidt and Kurt Weitzmann, Die byzantinischen Elfenbeinskulpturen des X.–XIII. Jahrhunderts, vol. 2, Reliefs (Berlin: Bruno Cassirer, 1934), 38–39, no. 44, pl. 19. and Venice.John the Evangelist and Paul, ivory, ivory, Museo Archeologico, Venice. See Adolph Goldschmidt and Kurt Weitzmann, Die byzantinischen Elfenbeinskulpturen des X.–XIII. Jahrhunderts, vol. 2, Reliefs (Berlin: Bruno Cassirer, 1934), 38, no. 43, pl. 19. It belongs to one Landau,Nicolas Landau (1887–1979), an antiquities dealer known as “Le prince des antiquaires.” Born in Varsovia, he studied law in Paris before becoming an antiquities dealer in New York and then in Paris, where he had a business on the rue de Duras. or rather to someone he knows, and he won’t or can’t give any information about its provenance or history. It doesn’t figure in any of the books, and appar. has never been published. Of course it’s fragmentary; but the essential parts are there, and the quality !!!! the hair, among other things, is exquisitely beautiful. Altogether a bad business. Landau,Nicolas Landau (1887–1979), an antiquities dealer known as “Le prince des antiquaires.” Born in Varsovia, he studied law in Paris before becoming an antiquities dealer in New York and then in Paris, where he had a business on the rue de Duras. Dodge says, wants $25,000. This is altogether too much. We have hopes of getting for about that price, a) Prince L’sPrince Friedrich Leopold of Prussia. marble B.V.,BZ.1938.62. which is after all a complete thing, and even rarer and nobler; and b) the two Dresden ivories, the Christ in the Garden (with trees and birds etc), and the 2 Saint one, both of them in flawless condition. As between the 2 Dresden ivories and Landau’s, or even between the single Christ in the Garden which for me ranks even with the Romanus and EudoxiaChrist Crowning Romanos and Eudoxia, ca. 945–949, ivory, Département des Monnaies, Médailles et Antiques, Bibliothèque Nationale de France, Paris. as the world’s finest ivory, and Landau’s, I’d not hesitate a moment to advise the Dresden one. Perhaps I’d take Landau’s rather than the Dresden 2-Saint piece. As I’ve implied, I haven’t the very faintest doubt of the genuineness of Landau’s.Nicolas Landau (1887–1979), an antiquities dealer known as “Le prince des antiquaires.” Born in Varsovia, he studied law in Paris before becoming an antiquities dealer in New York and then in Paris, where he had a business on the rue de Duras. Landau’s ivory is BZ.1939.8. Well, you’ll see the photo., and judge. It’s a teaser of a question. I’ll say this, that for a completely unknown ivory, it jumps at once into the very first rank. I told Dodge $25,000 was far too much. It might be a good thing to let LandauNicolas Landau (1887–1979), an antiquities dealer known as “Le prince des antiquaires.” Born in Varsovia, he studied law in Paris before becoming an antiquities dealer in New York and then in Paris, where he had a business on the rue de Duras. simmer for a while; we may soon have some news of Dresden. Fiedler has gone off there again this week. Bill saw the ivory with me, and agrees with what I’ve said. Quite independently of me, he said, when I showed him the photo. of the Prince L marble slab, that the marble was a nobler work of art. By the way, LandauNicolas Landau (1887–1979), an antiquities dealer known as “Le prince des antiquaires.” Born in Varsovia, he studied law in Paris before becoming an antiquities dealer in New York and then in Paris, where he had a business on the rue de Duras. has shown the ivory to “no one”—but he did take it to London and showed it to Eric. Bill will try and find out what Eric thought of it. Eric is so bitten by the fake-bug that I shouldn’t be surprised if he thought it wrong. Not quite. I would be surprised, even from Eric.